After Labor’s Civil Wars, What Does Reconstruction Require? 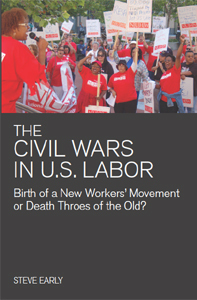 Steve Early’s new book The Civil Wars in U.S. Labor tackles the series of messy internal disputes that wracked the labor movement for much of the last decade, many involving the Service Employees (SEIU) and its controversial former president, Andy Stern. Civil Wars helps make sense of labor’s conflicted last decade, while asking an important question in its subtitle: Birth of a New Workers' Movement or Death Throes of the Old? In the 1990s, labor’s future seemed much more promising. A series of militant struggles, such as the 1989-90 strike by miners at Pittston Coal, offered a new path forward for unions. Labor seemed poised to finally take the offensive after more than a decade of retreat and decline. Riding a wave of discontent, John Sweeney and his New Voices team won leadership of the AFL-CIO in 1995, their winning margin supplied by the Teamsters’ reform president, Ron Carey. Labor’s new leadership promised an offensive strategy, committing to organize the unorganized and rebuilding ties with progressive social movements. Labor was on the move and “Leading the Way” was SEIU, as the union’s purple T-shirts immodestly proclaimed at the time. A decade later, this sense of forward momentum disappeared. Confusing many supporters, SEIU battled the California Nurses Association (CNA), a union holding some of labor’s most progressive positions on issues such as forming a labor party and single-payer health care. In short order, SEIU trusteed its own massive California health care local and became entangled in the messy split of its former partner, UNITE HERE. Early, long an outspoken opponent of what he sees as SEIU’s staff-driven unionism, devotes much of Civil Wars to a withering critique of the partnership model of growth favored by Stern, who retired in 2010. In painstaking detail, Early dissects SEIU’s most controversial activities: the top-down organizing of home care workers, Stern’s promotion of labor-management cooperation, and the consolidation of local unions that produced centralized mega-locals. Early details SEIU’s war with the CNA, contrasting the CNA’s “aggressively marketed brand of ‘social unionism’ to Stern’s ‘new corporate unionism,’” including a detailed account of SEIU’s thuggish attack on the 2008 Labor Notes conference. Early provides considerable detail about the January 2009 trusteeship of the massive SEIU United Healthcare Workers-West (UHW) local in California, which came after UHW leader Sal Rosselli began to speak out against Stern’s “back-door dealings with Gov. Arnold Schwarzenegger about compromises in health care reform legislation in California that were opposed by the state AFLCIO.” As the conflict intensified, differences surfaced over what UHW regarded as cozy dealings with national health care chains, which circumvented the local bargaining committees. Early is upfront about which side he takes—he was active in fighting the trusteeship of UHW. To activists inside SEIU and SEIU’s remaining outside supporters, his relentless critique is bound to come across as one-sided. In his defense, Early details in his introduction his repeated and unsuccessful attempts to obtain interviews with top SEIU leaders. More importantly, the facts speak for themselves. He provides plenty of facts, backing up each assertion with meticulous detail, producing a well-documented book with hundreds of footnotes. Readers need to be careful not to allow Early’s blistering criticisms of SEIU to obscure the bigger problems facing the labor movement, however. SEIU is not the problem but merely the symptom of a labor movement lacking the tools necessary to fight management’s assault. In fact, SEIU’s relentless focus on the need for change is a welcome alternative to a labor movement mired in complacency. To their credit, SEIU leaders shook up the labor movement at a time when many unions seemed content to drift into oblivion. Their industry-wide approach to organizing introduced commonsense economics into union strategy. SEIU opened the door to progressives, hiring many staffers from outside the union, and busted up complacent local fiefdoms in favor of a more activist approach. The union put its money where its mouth was, shifting resources into organizing the unorganized and reaching out to immigrant communities long ignored by labor. One hopes Early’s critiques will prompt some soul-searching inside the post-Stern SEIU. For other unionists, Early’s relentless focus on grassroots activism can help point a way out of labor’s current fog. The central point flowing through The Civil Wars in U.S. Labor remains indisputably valid—the true source of union power is a mobilized rank and file. Joe Burns’s book Reviving the Strike: How Working People Can Regain Power and Transform America will be published this spring. He is a labor negotiator and attorney and a former local union president, and can be reached at joe [dot] burns2 [at] gmail [dot] com. Steve Early's book is available for purchase here.